StagePRO series KB868K is a universal "X" keyboard accessory shelf that is great for laptops, stamp boxes, mixers or DJ controllers. Ideal for the professional keyboardist and DJ. 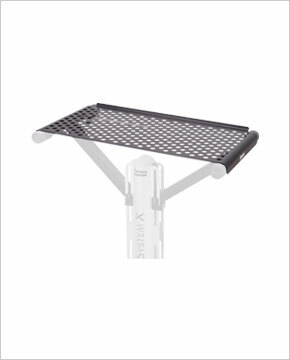 It will attach to any "X" style keyboard stands to create a desk-like platform for a wide variety of gear. Easily adapts to a range of widths (up to 24 inches wide) with a clamp on the underside of the shelf. Tooled grating accommodates equipment tie-downs or discreet wire routing between devices. Each end of the accessory shelf is rounded to provide a secure fit to the keyboard stand or 2nd tier. The front and back edges of shelf are rolled to provide extra rididity and a comfortable work surface.